Owens Murphy has always been my go to dealership!! Have purchased a couple Land Rover and Volkswagens from them and sales to service I have never had a problem. Super nice and professional always!! Love them!! Again thanks to Matt and Jonathan for their superb professionalism and customer care. All of the staff at Owens Murphy are a credit to the organization. I've been doing my car purchase with Owens Murphy for the past eight years, and have been a very satisfied customer. My 2019 Jaguar was a easy purchase without the run-a-round you may experience at other dealerships. I picked the car I wanted, and Matt and Jonathan did everything right, to ensure that I got the car I desire. Thanks Matt and Jonathan. The lot was clean and so was the facility. The staff were super hospitable with each interaction that was had from sales, financing, and even service. The photos posted of the car online were a great reference before coming to see the car in person. I wish this lot was located in my home state! They helped setup my car features before I left the lot, answered any questions and walked me through additional details about the vehicle. They even called to follow up several days after purchasing the vehicle. Would visit them again in the future. Very professional sales process. Love how they do business. 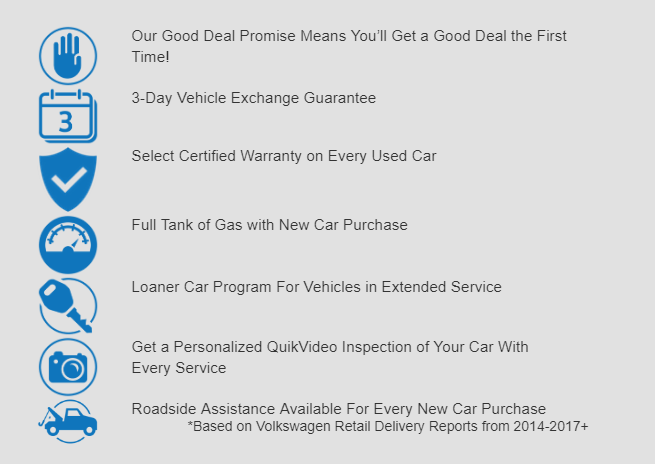 Let us show you just how easy it is to find your next vehicle at Owens Murphy Volkswagen. Whether you’re looking for a sporty sedan, a fun convertible, crossover, or SUV, the team at Owens Murphy Volkswagen is here to help. Our Little Rock dealer carries a wide selection of new and used Volkswagen models, giving shoppers plenty of options to choose from. We also offer a service department for all your Volkswagen maintenance and repair needs. We are proud to call Little Rock home and give the people of the area the service they deserve. Owens Murphy Volkswagen is family owned and operated and strives to make each car buying experience an incredible one. Since we first opened in 2010, we have been dedicated to providing only the very best selection and customer service. Our sales team does not pressure and hassle shoppers, they are just friendly people who are here to help you find your dream car! We believe in a personalized shopping experience and are go the extra mile to help our customers find exactly what they are looking for. New vehicles are appealing, but sometimes a pre-owned vehicle just makes more sense. That’s why we offer a large selection of certified pre-owned Volkswagen models. To receive the recognition of certified pre-owned, a vehicle must undergo an extensive, multi-point inspection. This program has many guidelines and Owens Murphy Volkswagen service technicians work tirelessly to ensure everything is in order. Only after the vehicle passes the rigorous inspection does it earn the title and can be considered for the Owens Murphy Volkswagen inventory. This goes to show that shoppers receive nothing but exceptional quality when they shop with us! We are more than a Volkswagen dealer and in addition to an extensive selection of vehicles, we also offer a full-service department. Whether your Volkswagen is in need of an oil change or an extensive repair, the experts at our Little Rock Volkswagen service department have it covered. Our team of experts have the industry knowledge, skill set and top-of-the-line equipment to complete repairs and maintenance quickly so you can get back on the road. No matter which car you may drive, our team can help. Our parts department is also full of professionals who can get you the genuine parts you need and deserve for your ride. Whether your vehicle needs service or you are simply looking for your dream car, the contact Owens Murphy Volkswagen for help by calling (833) 664-0332. Stop in and visit us today at 25 Colonel Glenn Plaza Dr Suite C, Little Rock, AR 72210 today.